My garden is really doing well this year and I’ve been eating lots of spinach, kale and chard. This is the first year I’ve planted kohlrabi and fennel. Both are ready to harvest, so I looked up some recipes. Dinner tonight consisted of a kohlrabi and fennel salad and kohlrabi greens with toasted sesame oil and wheat-free tamari (instead of soy). I really liked the nori/sesame seed/crushed red pepper garnish on the kohlrabi greens – gave it a really unique taste. I also think that since I used ingredients from my garden, the taste was fresher. 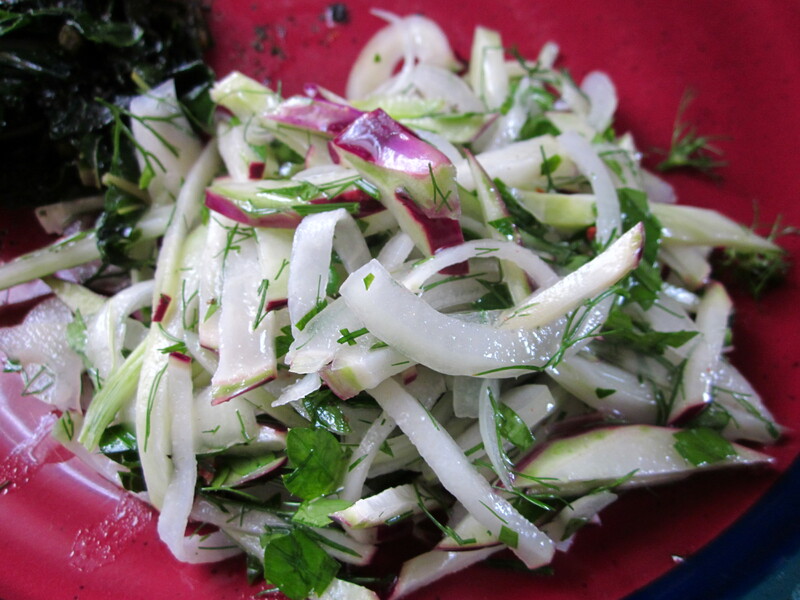 Plus, the fennel wasn’t as strong tasting as that bought in the store, so the fennel & kohlrabi salad had a mild taste. The kohlrabi itself tasted slightly like cabbage, yet a little like broccoli. My husband loved both recipes, so I’ll most likely make them again.